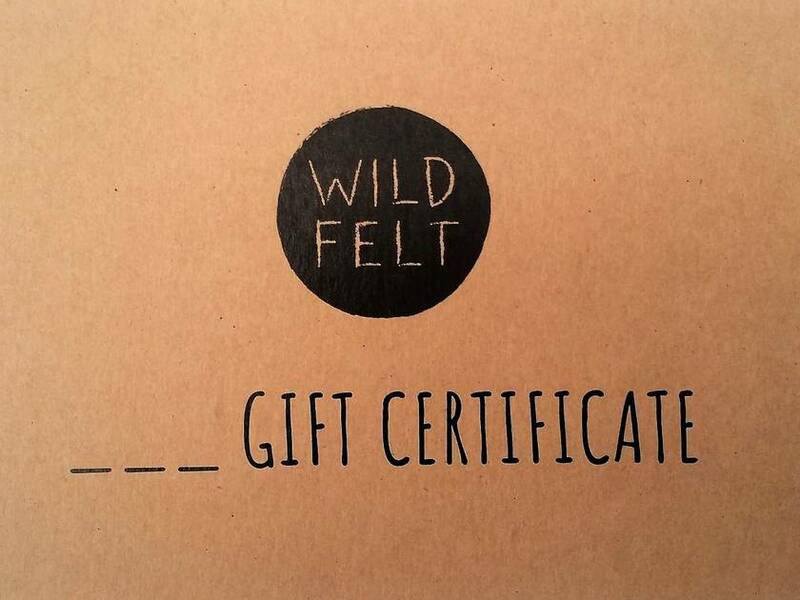 Wild Felt gift vouchers are the perfect gift for your creative friends/family members. 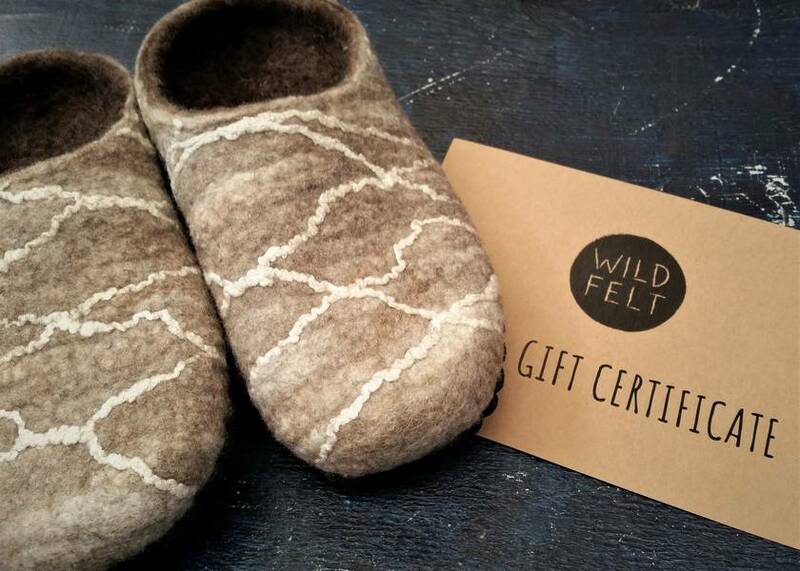 They can be used to purchase any item in the Wild Felt online store, including custom made orders! They can also be used to pay for felt making workshops, located in Christchurch. The vouchers are printed on recycled cardboard and come in a brown paper envelope, ready to give. They look original and handcrafted - just like the products you can purchase with them! This listing is for a $25 voucher. Vouchers are available in any amount - check out my other listings for $50 and $100 vouchers. If you would like a different amount please purchase the closest denomination and write in the comments the amount you would like (and make payment for this amount!). 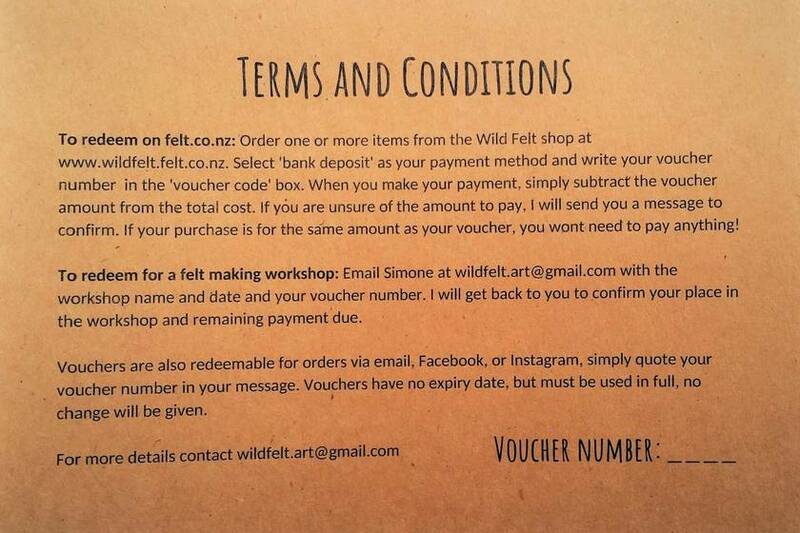 To redeem on felt.co.nz: Order one or more items from the Wild Felt shop at www.wildfelt.felt.co.nz. Select 'bank deposit' as your payment method and write your voucher number in the 'voucher code' box. When you make your payment, simply subtract the voucher amount from the total cost. If you are unsure of the amount to pay, I will send you a message to confirm. If your purchase is for the same amount as your voucher, you wont need to pay anything! To redeem for a felt making workshop: Email Simone at wildfelt.art@gmail.com with the workshop name and date and your voucher number. I will get back to you to confirm your place in the workshop and remaining payment due. Vouchers are also redeemable for orders via email, Facebook, or Instagram, simply quote your voucher number in your message. Vouchers have no expiry date, but must be used in full, no change will be given.